Up On Tippy Toes: Stay warm! I’m neck deep into Christmas card making this year and I’m afraid I just skimmed barely made a dent in my mailing list…. sigh. Thank goodness I enjoy cardmaking so much!! I’ve found coloring to be very therapeutic and coloring my stamped images is an awesome outlet! I think of stamped images as mini adult coloring pages. Adult coloring books are all the rage nowadays and though I absolutely LOVE them I often find it hard to keep the coloring momentum going. Then there’s the question of what do I do with it after I’m done… hmmm. I’ll stick with my stamps! Each image not only brings me joy coloring it but then it moves on to share a bit of that happiness to someone else. 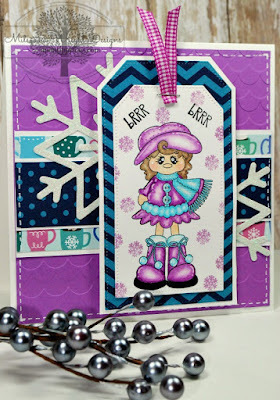 Today, I’m sharing this adorable card I made with Pink and Main’s Scarlett. 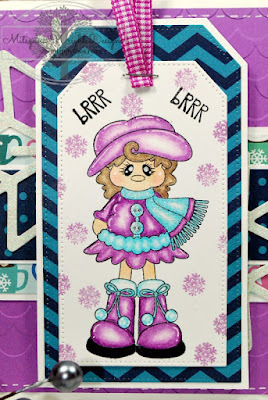 I absolutely think she is uber adorable and love, love, love her boots with those little pom-poms!! She is too stinkin’ cute for words!! All patterned paper is from Pebbles Inc. and is from the Winter Wonderland Collection. This card totally describes the weather we’ve been having this week! You know it’s cold outside if you’re dressed like this inside!! Brrrr… Stay warm everyone!! She is just DARLING!! Your card is so BEAUTIFUL! Thank you so much Migdalia!! What a great card and stamp set! Awesome coloring!